No responsible elected official or honest professional can ignore the truth – which is unbelievably ugly! The increased use of cellular and wireless technology, electronics, and household appliances in the past 50 years means that people today are exposed to some incalculable amount of invisible, odorless, and tasteless EMF (electro-magnetic field) radiation – which our bodies cannot detect! Scientists, globally, say that this non- thermal EMF poses the most serious threat to human health and safety – ever, and threatens planet Earth’s environment! North America’s public needs to wake up and realize that just a handful of multinationals now own and/or control the mainstream news media outlets – who govern what North Americans are permitted to see on TV, hear on the radio and read in newspapers. No wonder that North Americans, generally, areoblivious to the battles and litigation, including numerous class-action lawsuits, that have been – and are – occurring in virtually every jurisdiction on earth where EMFs have impacted negatively on people’s lives. Classic examples include: expensive, fire-prone, intrusive and hazardous ‘smart’ meters (the quintessential Trojan Horse), which surreptitiously invade every home on which one is attached and is operating; overhead power lines, substations, power transformers, etc. which are situated dangerously close to schools, playgrounds, residential communities, homes, etc. ; and, cell phone towers, which are situated literally on schools, on apartment buildings, in communities, in churches, etc. At this moment, telecom companies are rolling out their Firth Generation or “5G” technology, which scientist say will expedite man’s demise! Local governments in particular need to educate themselves, if it is not already too late, about 5G and what it will mean to their community. Once implemented, 5G technology will neuter all governments. No longer will telcos be obliged to liaise or consult with local governments as to where and how many cell towers will be placed throughout – yes – throughout a community! 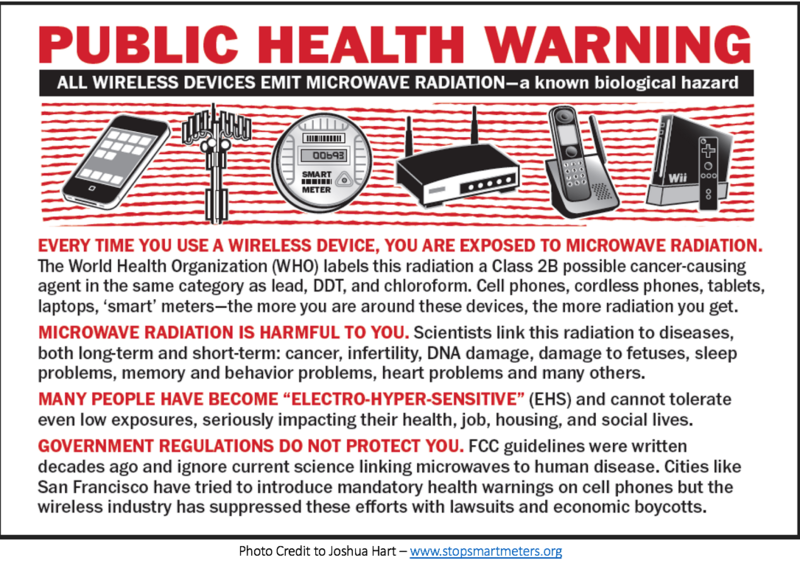 Current literature says that at least every 10th house and as frequent as every 2nd or 3rd house will have a cluster of ‘micro-cell’ towers in front of it, ensuring that no living person or thing can escape being chronically bathed in microwave EMF radiation! As a former Canadian Armed Forces electronic warfare (EW) and signals intelligence (SIGINT) officer (see BIO, below), I find it shocking, inconceivable and completely unacceptable that Canada, a country which touts itself to be a model democracy, does not have – and never has had – a qualified EMF health ‘expert’ – anywhere in this entire country – dedicated to protecting the people of Canada from EMF radiation and protecting those already suffering from electro-hypersensitivity “EHS”! According to the Internet, Canada’s Minister of Health, Ginette Petitpas Taylor, has no credible education or expertise in EMFs and/or EHS! Nor does Canada’s recently- appointed Chief Science Advisor, Dr. Mona Nemer! Nor does British Columbia’s Centre for Disease Control (BCCDC) have anyone with such expertise! Nor did British Columbia’s Provincial Health Officer (PHO), Dr. Perry Kendall, MD, who retired just recently after holding that position for about 19 years (1999-end Jan., 2018). Because of him (i.e., his ignorance of this topic) British Columbians now have Wi-Fi routers, cell phones, cordless phones, Bluetooth, tablet and laptop computers in cancer clinics, hospitals, nursing homes, etc., and ‘smart’ meters on every home in the province! Because of his ignorance, cell phone towers are situated dangerously close to hospitals, residential areas, etc.! Because of his ignorance, electric utility overhead power transmission and distribution lines, substations, power transformers are situated dangerously close to communities, etc. Safety Code 6 was established, in 1979, by Dr. Michael Repacholi, who orchestrated things such that SC-6 ‘guidelines’ were identical to those of the U.S. military’s ‘thermal- only’ standard, which the U.S. Navy had former German scientist, Dr. Herman P.